Tom practically had to sit on me over the weekend to keep me from running Lilly down to the nearest veterinary emergency room. Starting last Wednesday, April 4, 2012, Lilly began acting VERY sick again. She only got worse over the weekend — a holiday (for many), of course! Because of snow and cold temperatures early last week and then our wedding anniversary on Wednesday, Lilly didn’t get her usual 3-mile walk for several days. She began showing signs of lethargy Wednesday, so I only walked her 1.5 miles Thursday. 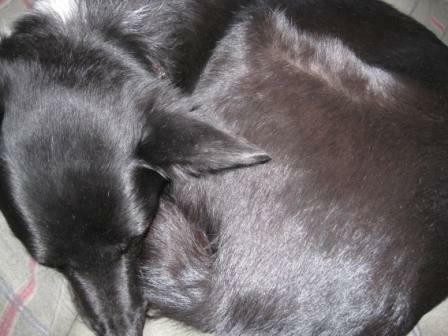 She seemed worse Friday, spending most of the day curled into a tight ball, so we didn’t walk at all. Saturday I reminded myself that our neurologist told me at our last appointment that there wasn’t anything bad I could do to Lilly through physical exertion, so we walked the full distance. Then, Sunday Lilly could barely walk and mostly sacked out. Perhaps you can see the tension in her face. She has a really different countenance when she doesn’t feel well, and I feared for her brain. No one warned me that a relapse was possible, but another Veterinary Referral Center of Colorado / Rocky Mountain Veterinary Neurology client — who follows us on Facebook and who is also named Roxanne — posted a Facebook comment that they’ve been through a couple of relapses. The solution she pointed out has always been to adjust meds. Oddly enough, that made me feel better … because I had this idea that Lilly would ONLY improve over time. So, I stayed tough, monitored Lilly closely all day Sunday, and waited to call Rocky Mountain Veterinary Neurology Monday morning, and they increased the frequency that Lilly takes steroids. She had been getting 1/4 of a pill every 3 days. Now, she will bet 1/4 of a pill every other day. I have high hopes that she starts feeling better and regains her sense of balance soon. So sorry to hear that Lilly is experiencing a relapse, sending you all of our most positive thoughts. 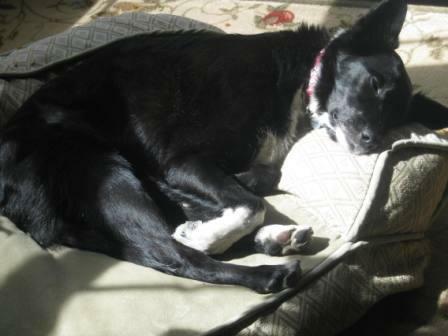 Kiva is also being cared for by Dr. Lane at RMVN for degenerative neurological disorders. Ruby’s Raiser recently posted..Ruby and David Pupdate! Thanks, @Ruby’s Raiser. I’m sorry to hear about Kiva’s troubles. Maybe we’ll be at Dr. Lane’s on the same day sometime. I’m sorry to hear about Lilly’s relapse. Hopefully all will be well again soon! Roxanne, so sorry to hear of your dogs problems. I used to have a miniature schnauzer that was sensitive to meds. She had some reactions and was so sick. She was hit by a car when about 3 or 4. Neurologically it took her a long time to recover. We love them just the same. Keep your chin up and I hope this all works out well. What a way to spend a weekend, I’m so sorry 🙁 I do hope that tweaking the meds helps! We lost Tsar this morning. Hug Lily. So sorry to hear this. Run free Tsar you were so loved and will be so missed. Oh, Sue. I’m so sorry for your loss. I’ve been otherwise occupied, so it seems really sudden to me … which is scary. All of us here send our best love and support in your time of grief. Hoping this is just a bump on recovery road. Still, my heart aches for Lilly and you. Roxanne, my heart goes out to you. I think of you + Lily alot. By the way, Happy Anniversary! Do so hope the adjustment of Lily’s meds help her. You sound so down and worried. Take care of Mommy so you can take care of Lily. I remember so well when my girl Hoodie got hit by a truck about 2yrs.ago. She was pretty messed up, tail completely separated from her spine, internal bladder injuries, didn’t think she was going to make it and that her tail might have to be removed. Had only had her 6mo, at that time and the possibility of losing her was way to much to bear. Didn’t leave her side at all except to wash sheets and towels that she needed. Slept on the sofa with her every night till she slowly was on the mend. She is showing effects from the accident even now. She will be 6 in June and is my spiled sweet girl. So sorry for being so long winded, if any would understand, its you. Thank you so much for your story. Will be praying for you guys. I’m so sorry that you guys are going through all this. I’m thinking of you, and I hope Lilly feels better very soon! I’m so sorry about Lilly’s relapse. You and Lilly are in my thoughts and prayers. I’m so sorry Lilly had a relapse, although I guess it helps to know that it does happen sometimes. Hope she is feeling better soon.